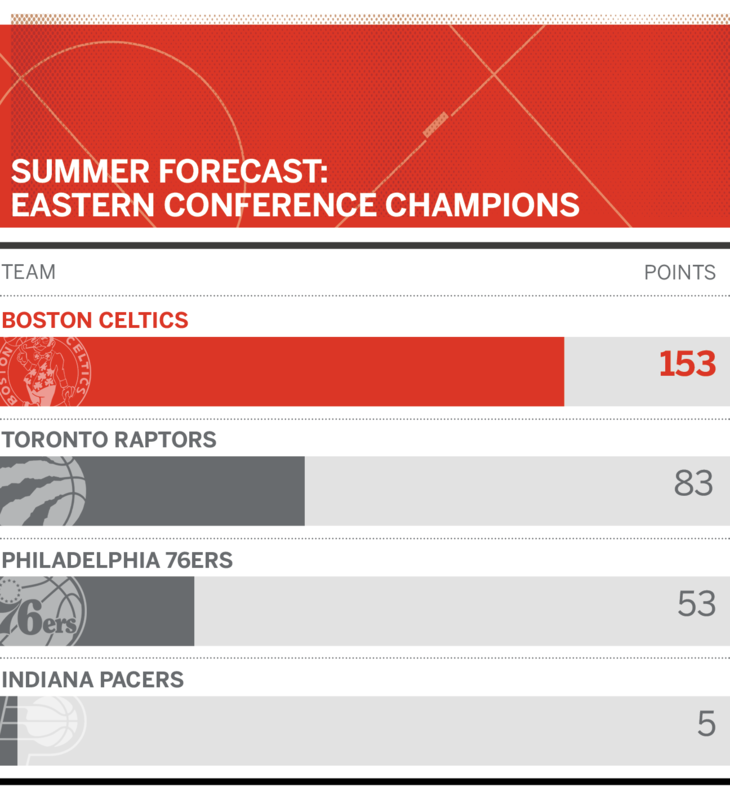 We asked the ESPN Forecast panel to rank its top choices for the Eastern Conference champs, Western Conference champs and NBA champs. With LeBron leaving the East, the Celtics are officially the presumptive kings of the conference. They've had as good of an offseason as anyone else in the league without making any major moves, because they'll add back a healthy Kyrie Irving and Gordon Hayward to a blossoming roster that was good enough to play in the conference finals last season. 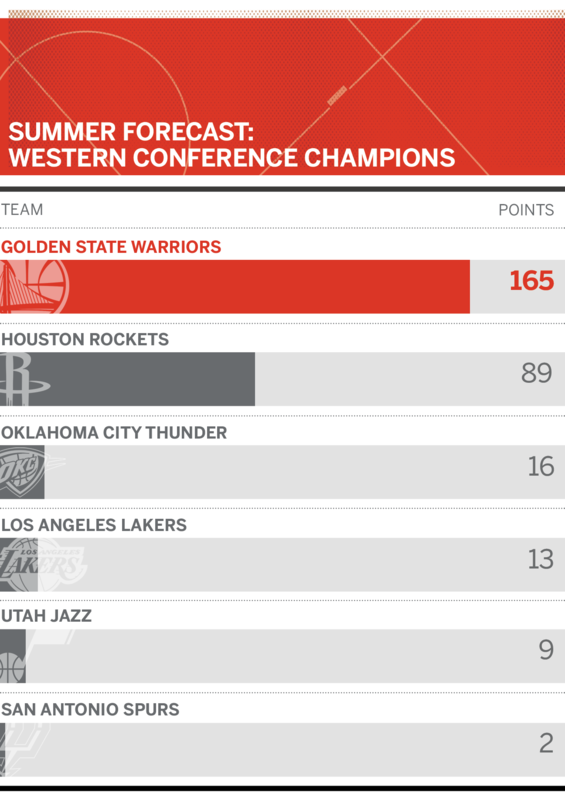 Coming off a second consecutive NBA title and three out of the past four, the Warriors will face an even bigger battle with their arch-nemesis: complacency. The West is deeper and meaner than ever, and maybe LeBron joining the mix will be the kind of inspiration to inject focus and reject boredom. 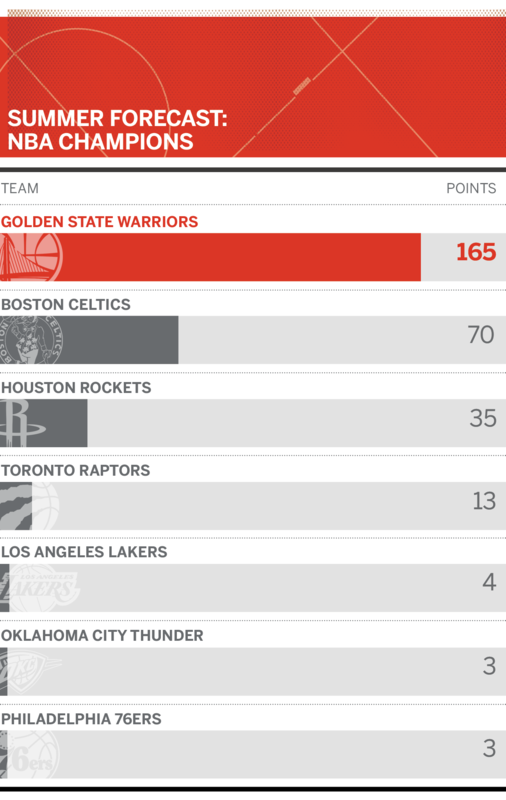 But the Warriors understand that the first 82 games are a formality. If the Celtics' young players can continue to progress while fitting in with their returning All-Star talent, Boston has a roster that is as close to the Warriors' as anyone in the league. A trio of Al Horford, Irving and Hayward is eyebrow-raising on its own. But with Jayson Tatum, Jaylen Brown and Terry Rozier, it's extra intriguing.